I guess the venality of the new US Presidency isn’t creating enough news for the Australian press. On January 29, 2017, the Fairfax press wheeled out the veritable debt scaremongering in this article – Scott Morrison to lift credit limit as Australia’s debt hurtles towards $500 billion – reporting that the Australian government “will be forced to lift its own self-imposed credit limit in the coming months as debt hurtles towards half-a-trillion dollars”. Instead of writing about how stupid and unnecessary this ‘self-imposed limit’ is, the journalist wanted to talk about the disaster that awaits us as the debt of the currency issuing government “hurtles” like some asteroid to its death towards half-a-trillion dollars. As I said, must have been a day that imagination in the journalistic world was lacking. The worst part of the story is not the idiocy of its logic or the fact that it links to an inane Australian Debt Clock homepage, but, rather, the reported response from the Labor Party Shadow Treasurer. The Labor party is meant to represent the workers and claims to be the progressive force in Australian politics. That ladies and gentlemen is the sick joke of all time. This is a party that has abandoned its traditional remit (to defend the well-being of workers) and instead spouts neo-liberal gibberish without knowing it. The tenet of the article is obvious. They might have added that the information is largely irrelevant when it comes to the Public debt clock – for a start they erroneously add public and private debt together as if that summation has meaning. 2. We read that “When the government reaches the $500b milestone – officially due mid-year but possibly sooner – it will raise fresh questions about the Coalition’s claim to be a more responsible economic manager than Labor”. As if the level of public debt tells us anything about responsible economic management. What does it tell us about distance from full employment? What does it tell us about economic opportunity for the most disadvantaged? What does it tell us about environmentally sustainable economic growth? What does it tell us about income inequality? Answer to all questions: zero. 3. In 2013, the conservative government (still in power) was days away of breaching the legal federal debt limit. The Labor Party, at the time, were raving on about how the government was failing because they were about to breach the limit. As if that mattered on iota. The amount of press space that charade took up was amazing given how irrelevant the whole issue is. However, the Labor Party did correctly make the point that the conservatives were hypocritical. Prior to the 2013 election, the conservatives, then in Opposition, mounted a massive scare campaign about the state of the federal deficit and the rising public debt. They predicted all sorts of doom would befall the nation. They also refused to accept that Australia has just come through the worst economic and financial crisis the world had seen since the 1930s and that the increased fiscal deficit had saved us from recession. Australia was one of the advanced nations that did not record an official (technical) recession during the GFC. Our fiscal deficit would have risen without the rather large discretionary fiscal stimulus that the Labor government (at the time) brought in in late 2008 and early 2009. But, had that discretionary action not been taken, Australia would have followed the rest of the world into the recessed world of high unemployment and negative growth and all the attendent negative consequences that accompanied that situation. And … the deficit would have risen. In that case, I would have considered the rising deficit to be bad, because it was mirroring the negative outcomes related to the downturn in the cycle. But, the discretionary action created a good deficit increase because it prevented a major slowdown. The conservatives were silent on all that – content to focus, for political reasons, on the raw numbers helped by inane WWW sites like the Australian Debt Clock. When the conservatives took office in 2013, they faced the reality of a slowing economy due largely to the Labor government running scared in the fiscal year 2011-12 and cutting discretionary net spending before the non-government sector had recovered its confidence. The slowing economy undermined tax revenue growth and the on-going welfare payments as a result of rising unemployment (the ‘automatic stabilisers’) caused the deficit to increase. As a result of the Australian government’s voluntary (and unnecessary) decision to match its deficit ($-for-$) with debt-issuance to the private bond traders, public debt rose in absolute terms as did the debt ratio. They soon worked out that they couldn’t go on predicting the worst because they were now in government – and so the narrative shifted quite remarkably, leading up to the debt ceiling being eliminated. It was sick comedy really. Today we are removing the instrument for parliamentary brinkmanship introduced by Labor when they created a legislative limit. The debt limit was an artificial construct that never constrained Labor’s spending. The absence of a limit does not mean that the Government will not be prudent and responsible. In its place, they introduced a voluntary debt statement where the Treasurer would inform the Parliament each time the debt increased by $A50 billion or more and give reasons. The Parliament can no longer reject the increase. The Treasurer (Scott Morrison or ScoMo which shortens to Scum) now also has to inform the so-called Australian Office of Financial Management (AOFM), which which was set up as a special part of the Federal Treasury to management federal debt. The Australian experience is common around the world in almost all countries. The journalist’s time would have been better examining why the AOFM was set up in the first place. The first point to note is that unlike a household or a business firm, a sovereign government such as Australia is never revenue constrained because it is the monopoly issuer of the currency. Sovereignty has a very particular meaning in Modern Monetary Theory (MMT) and requires a national government issues its own currency and floats it on international markets. So Greece or Germany are not sovereign nations. Australia is. A household or a business firm uses the currency issued by the government. It always has a financial constraint and must seek funds from saving, asset reduction, earnings or borrowing before it can spend a penny! Always! The sovereign government issues the currency and, financially, can spend whatever it wants as long as there are real goods and services available for purchase in that currency. This is not the same thing as saying it should spend without care. The point is that it never has to ‘finance’ such spending. It clearly only should spend to advance public purpose which would initially require it ensure all spending gaps are closed and full employment is achieved. Achieving those goals is the hallmark of responsible economic management. Please read the following introductory suite of blogs – Fiscal sustainability 101 – Part 1 – Fiscal sustainability 101 – Part 2 – Fiscal sustainability 101 – Part 3 – to learn how Modern Monetary Theory (MMT) constructs the concept of fiscal sustainability. So there are limits on prudent government spending but they are never financial. So a sovereign government can spend however much it likes subject to there being real goods and services available for sale in that currency. Moreover, irrespective of whether the government has been spending more than revenue (taxation and bond sales) or less, on any particular day the government has the same capacity to spend as it did yesterday. Past surpluses do not provide the government with more capacity to spend as past deficits undermine that capacity. Further, there is no such concept of the government being ‘out of money’ or not being able to afford to fund a program. How much the national government spends is entirely of its own choosing. There are no financial restrictions on this capacity. Second, there is no necessity for governments to borrow before they spend. As I have explained before, sovereign government borrowing is a left-over from the convertible currency-gold standard days of fixed exchange rates. It has no real purpose in a fiat currency system with floating exchange rates although government debt can be used by the central bank in its liquidity management or reserve maintenance operations. But as we know – a simpler way of ensuring control over the target interest rate and to stop interbank competition in the context of excess bank reserves – is for the central bank to pay a return on excess reserves. But an even simpler solution is to leave the short-term nominal interest rate at zero and leave excess reserves in the system – the Japanese solution. Someone asked me the other day – “what purpose does a zero interest rate serve?”. Why should the target interest rate serve any purpose other than to keep the risk-laden rates out on the maturity curve as low as possible? If inflation or asset bubbles continue to concern you then use direct methods available in fiscal policy to discipline those problems. So why do they borrow? There are several reasons – some technical and others ideological. The technical reasons relate to central bank liquidity management and I won’t elaborate further. The point is that the central bank could create its own risk-free asset to use in open market operations if it desired. So treasury bond issuance is redundant in this case. Further, the central bank can simply offer to pay interest on excess reserves which, when you strip it down, is equivalent to the government issuing an interest-bearing bond in place of the reserves (that is, ‘borrow’ from the non-government sector). But, governments borrow much more than is needed to fulfill the liquidity management function of the central bank. So then we have to understand the ideological nature of government borrow and its intrinsic lack of utility other than to provide corporate welfare to lazy bond investors. The overwhelming sentiment of the business community and the conservative nature of our political system (and its participants) leads to a largely anti-government swell of opinion which is continually reinforced by the media – the ‘debt-deficit hysterics’, which are repeated in the Fairfax article cited above. The neo-liberal expression of this over the last three decades has overwhelmingly imposed massive political restrictions on the ability of the government to use its fiscal policy powers under a fiat monetary system to ensure we have full employment. We now accept very high unemployment and underemployment rates as a more or less permanent feature of our economic lives because of the political constraints imposed on government. As a result, governments imposes voluntary constraints on themselves for political reasons? They have ‘fiscal rules’ that allegedly limit what they can do and encourage them to act responsibly. Responsibility is erroneously represented by lower deficits (if not surpluses) and lower debt ratios, without any reference to the context in which these financial aggregates exist. The creation of the AOFM was an exemplary example of how this neo-liberal ideology works. While there was a lot of hoopla about it being an ‘independent agency’, the reality is that this is all largely cosmetic – the AOFM is still part of the consolidated government. Prior to this bond issues were made using the ‘tap system’. The government would announce some face value and coupon rate (yield or interest rate) at which it would issue debt and turn the tap on hard enough to meet the demand at that yield. Occasionally, given other rates of return in the financial markets the issue would not be fully subscribed – meaning some of the net spending would be covered in an accounting sense by central bank buying treasury bills (government lending to itself!). It would have been much easier to eliminate the corporate welfare and just have the central bank crediting bank accounts on behalf of the treasury – so called Overt Monetary Financing. … breaching what is today regarded as a central tenet of government financing – that the government fully fund itself in the market. It then became the central bank’s task to operate in the market to offset the obvious inflationary consequences of this form of financing, muddying the waters between monetary policy and debt management operations. As to the so-called “central tenet” – this is pure ideology and has no foundation in economic theory. It is a political statement. Please read my blogs – OMF – paranoia for many but a solution for all and Helicopter money is a fiscal operation and is not inherently inflationary and Overt Monetary Financing would flush out the ideological disdain for fiscal policy – for more discussion on this point. But the impact was to constrain the government from creating full employment, which the conservatives hated because it threatened to redistribute more of the national income toward labour. Since the 1980s as governments maintained high rates of labour underutilisation under pressure to do so from the business lobby, the profit share in national income has burgeoned. Further, there is an automatic assumption drawn from neo-liberal doctrine that fiscal deficits are inflationary and have to be funded. The former statement is not necessarily true (it might be true under special circumstances that have not applied for a long time) and the latter statement about funding is untrue – categorically. Anyway, the Federal government introduced some really stupid reforms to the way government bond markets operated. All these policy choices and changes to the “operations” of the bond markets were voluntary choices by the Government based on ideology. They replaced the tap system with an auction model to eliminate the alleged possibility of a ‘funding shortfall’. Accordingly, the system now ensures that that all net government spending is matched $-for-$ by borrowing from the private market. So net spending appeared to be “fully funded” (in the erroneous neo-liberal terminology) by the market. But in fact, all that was happening was that the Government was coincidentally draining the same amount from reserves as it was adding to the banks each day and swapping cash in reserves for government paper. The bond drain meant that competition in the interbank market to get rid of the excess reserves would not drive the interest rate down. The auction model merely supplied the required volume of government paper at whatever price was bid in the market. So there was never any shortfall of bids because obviously the auction would drive the price (returns) up so that the desired holdings of bonds by the private sector increased accordingly. As an aside, at that point the secondary bond market started to boom because institutions now saw they could create derivatives from these assets etc. The slippery slope was beginning to be built. What this allowed was the relentless campaign by conservatives, still being fought, against the legitimate and responsible use of fiscal deficits. What this led to was the abandonment of full employment. 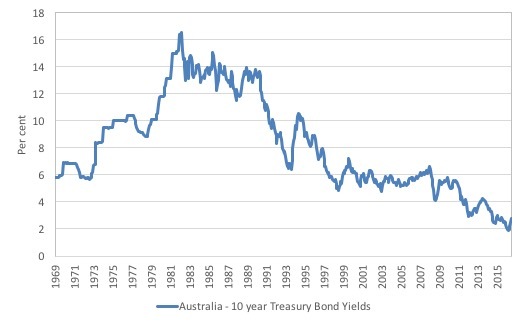 As an aside, in this blog – Bond markets require larger budget deficits – under the heading Special Pleading Classic One – I relate the story of the 2002 Review of the Commonwealth Government Securities Market conducted by the Australia government. Essentially, the federal government had been running fiscal surpluses since 1996 and retiring outstanding debt to the point that the outstanding stock of federal government debt fell dramatically. As this was occurring, the key financial market players who had been vehemently demanding the conservative government retrench the welfare state, cut government spending and introduce widespread deregulation started to realise that the thinning bond markets were not in the best interests. The Review was announced after the industry had lobbied the federal government relentlessly to salvage their own corner of corporate welfare. The upshot was that even though the government was running surpluses it agreed to continue issuing debt so that the private markets would have access to the guaranteed annuity. It exposed the lie that the debt was being issued to ‘fund’ the government deficit (which was non-existent). So, within that system of voluntary constraints, the government is now having to make a statement to the Parliament explaining why public debt is approaching half-a-trillion dollars. 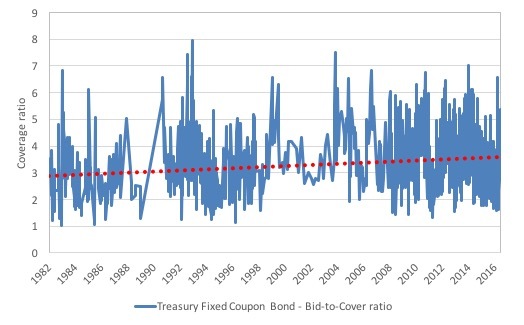 The following graph shows the bid-to-cover ratio on Treasury Fixed Coupon Bond issues since August 5, 1982 up to January 27, 2016 (data available HERE). The red dotted line is a linear trend over the entire sample. Commentators regularly talk about the bid-to-cover ratio as if it matters for the ability of the government to ‘fund’ its spending. The ratio doesn’t matter because the Australian Government is not revenue-constrained so it could just abandon the auction system whenever it wanted to. A ratio of 0.00001 wouldn’t force the government to stop spending. The central bank would see to that. Further, it is highly interpretative as to what the ratio signals. It certainly signals strength of demand but how strong becomes an emotional/ideological/political matter. Even if you believed that the government was financing its net spending by borrowing, then a bid-to-cover ratio of one would be fine – enough lenders to cover the issue. Some commentators think that 2 is a magic line below which disaster is imminent. There is no basis at all for that. The only thing that the ratio signals is how strong demand is. A rising ratio signals that the authorised bond dealers want more government debt that their is being tendered at the auction. The trend is rising and since the GFC (when the public debt ratio started rising again) the ratio has averaged 3.5 across all tenders. 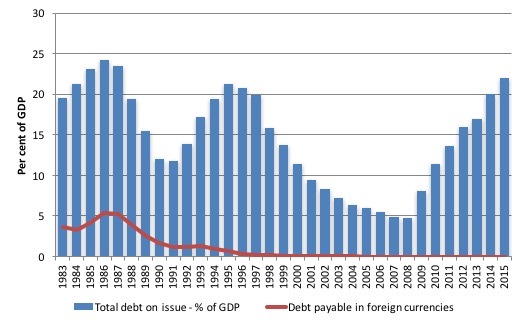 The next graph shows the outstanding Australian Federal gross debt as a per cent of GDP since 1983. So while the Fairfax articles uses terminology akin to astronomy (“hurtles towards half-a-trillion dollars”), the reality is that the ratio is low. And while public debt is “hurtling” upwards, yields are low and not going anywhere upwards soon. 1. The federal deficit is too small – given the negative GDP growth rate in the September-quarter 2016 (latest data). 2. Given the voluntary arrangements tying public debt to deficits, then the pubic debt needs to rise. 3. It would be better to abandon all this hoopla immediately and stop issuing public debt forever. The most tragic part – the Labor Party response. It notes that the outstanding public debt is now “almost double the number the Coalition inherited from Labor” in 2013. The Fairfax article quoted the Shadow Treasurer Chris Bowen. I wish he had kept his mouth shut. As the budget situation has become more urgent, the government’s actions to repair the budget have become less urgent. The government needs to stop the politics and lock in our AAA credit rating by implementing long-term structural budget reforms like Labor’s policies on negative gearing and capital gains. That is about as inane as one can get. 1. The invocation of the meaningless AAA credit rating saga. Please read my blogs – Don’t fall for the AAA rating myth and Austerity is the enemy of our grandchildren as public infrastructure degrades – for more discussion on this point. There is zero risk of default on Australian government debt so what does a AAA or ZZZ rating mean? Nothing. The ZZZs are apposite – the discussion just puts people to sleep. If only. The problem with introducing it into the discussion is that the public are misinformed and have been conditioned to believe the AAA rating matters. The Labor Party spokesperson is thus perpetuating the misinformation and undermining the democratic choices of the citizens as a result. 2. The “tests” the government set itself (the voluntary limits and reporting) were ridiculous in the first place. Why not tell it how it is? The rising deficits and outstanding debt reflect the slowing economy and the stagnant labour market. That is the failure of government – not the canaries that sing because they have been programmed to do so (by the voluntary debt-issuance rules). Why would a Labor Party not want to educate the public in these matters (noting they are wilfully ignorant themselves)? Why not use this opportunity, once and for all, to shift the debate away from these meaningless ratios and limits and back onto things that matter – employment, inequality, well-being? 3. How can a “budget situation … become more urgent”? Again, invoking the faux claim that a rising fiscal deficit is somehow a matter of concern on its own – rather than understanding the context. There is nothing “urgent” about the rising deficit or the need for more debt to be issued. These are artifacts of the poor shape of the economy (deficit) and the voluntary rules to provide corporate welfare (debt issuance). The urgency is to restore sustainable growth and move closer to full employment with better matching of real wages and productivity growth. 4. “long-term structural budget reforms” advocated by the Labor Party just mean cutting the fiscal deficit and achieving surplus. Why would a government want to do that, especially when the current account is always in deficit of around 3 to 4 per cent of GDP? To aspire to run fiscal surpluses when the external sector is in deficit (and thus draining growth) is to force the private domestic sector to increase its own debt or push the economy into recession and run increased fiscal deficits anyway. The private domestic sector is already enduring record levels of indebtedness and cannot take on much more. Why would the Labor Party think it is sensible to pursue a fiscal strategy that will lead to increased private domestic balance sheet precariousness and eventual collapse? Answer: they haven’t a clue of these matters, or, worse, they know about them, but assume the public are ignorant and thus choose to politics on these scare triggers. It is very sad that the Labor Party cannot get beyond this neo-liberal obsession with public debt and deficits. They would win more votes if they took some time to reeducate the public on these matters and diverted the focus to things that matters – equity, full employment, climate etc. But as my next book argues (to be launched in September 2017 in London), the so-called progressives have abandoned that any semblance of being progressive. They are just ‘neo-liberal lite’ parties. Meanwhile, expect a torrent of articles in the press in the coming week about the debt limits in Australia. I might take the time out to count the number of socks I have in my sock drawer! It would be more edifying. Labor is as hopelessly clueless as is the LNP, and the Greens. They probably just fluked the recession saving spending as for sure Swan was soon on the backfoot under attack by Hokey [sic] et al about the big bad deficit. I’ve tried to get a comment through but with no result. However it might be changing. the Mainstream ideology is coming under attack from many quarters as its failings are becoming hard to mask. It looks to me the academic facade of support for mainstream thought is cracking up. Perhaps we will see some heterodox theories get space in academic circles soon. Considering the great damage the mainstream has done, it cannot change soon enough! Who funds all of these debt clocks? They appear to be popping up worldwide. In Canada there are boards (much like a score board) mounted on trailers being towed to University campuses across the country. They always draw lot’s of attention from local news and scare the b’jeezus out of the students; and, the administrations don’t seem to have the good sense to stop the nonsense, even when the facts are explained, so long as they are “peaceful” demonstrations. It’s not primarily the public that needs reeducation, it’s the labour/social-democrat party’s elites that is in dire need of reeducation. But they are probably beyond salvation. They have been heavily invested in fake economics like neoliberalism and its alternative facts for too long. There is no soft reset of the former working class party elites, it can probably only be done by upgrade the “hardware” to people with up to date specification. One bad thing about Trump is that all those fake progressives can pretend to be “real” progressives. Thanks Bill for another great article full of intellectual fresh air. We can expect the debt ceiling mantra to be quite strong in the first half of this year as the Americans will be joining the chorus around March 2017 as well and that will fill the airwaves and become part of the ether. The American debt ceiling is nearing its current limit. This knowledge makes it easier to understand rate rises in the face of decreasing credit demand: It allows private banks to earn more for lending the government its money at interest. The Australian Employment Party seems to be the only party that promotes MMT, including a Job Guarantee. It is barely on the radar though. Unless that changes the ALP might still be the least worst option (neoliberals with a somewhat kinder face?). You’ve just got to hope the next generation of politicians are more open to embrace new ideas. I can understand to a certain extent politicians who are thinking of their own political ambitions, its a base motive, but its understandable. They will say things they know not to be true to get elected. What I find odd are politicians who have left office, retired or been defeated – they suddenly embrace honesty about many issues where they were previously reticent, obfuscated or outright lied. Yet the way the economy works, how money works doesn’t seem to be one of them. They continue to cling to old ‘certainties’ like a life raft, long after the ship plumbed the depths. For such ‘high achievers’ they don’t seem to have a corresponding intellectual curiosity. Surely, somebody like Ed Milliband to take one example, who received an arse kicking from the press most days about Labour’s ‘profligate’ ways in government, might be asking some questions of himself and others. He has nothing to lose politically or personally. I find it incredibly strange. Thanks once again Bill …. He posted up the response/meme you are talking about here and i basically called him out for undermining the ability of the ALP to counter the Liberal Party’s blatant lies about “Debt”, Deficits, Fiscal Policy funding etc. This time I also put it to him that he must know what the actual reason Bond Sales happen. This is how I have been approaching the ALP on the matter for the last few years ….. Basically saying that they are playing right into the hands of the Liberal Party and the Wedge Politics that Neo Liberalism relies on to justify that Policy Agenda. I usually remind them that the Libs will always win that Political Game, so they have to find the courage to expose the Liberal Economic Lies ……. or variations on that theme. Aw, fair go Bill. In case you hadn’t noticed, the ALP is an Opposition; if some journo wants to write a scare article kicking the government they are not going to go out of their way to correct him. If I was Shorten I’d be parroting this “we’ll all be rooned and BTW it’s the gummint’s fault” bulldust too. Yes, Friedman did advocate flexible exchange rates. But he also hated capital controls, labour market regulations, welfare states, and other things that would ensured those flexible rates worked for the people rather than the speculators.